Dentistry is constantly changing and evolving as new, advanced technologies make diagnosing and treating oral health disorders more effective, less painful, and less complicated. Virtual treatment planning, digitalized diagnostics, and 3-D printing have already changed the dental industry over the past 15 years. 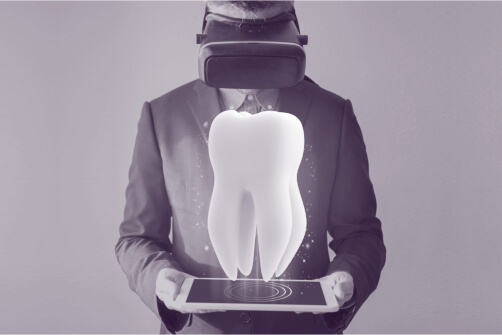 Now, we approach yet another innovation that has the potential of disrupting and transforming the entire cosmetic and restorative dental industry – augmented reality (AR). Augmented reality is already a part of our lives, although it is currently used primarily for entertainment purposes. It involves superimposing a digitalized image into a real, first-person view of actual surroundings, appearing to alter the reality to include the artificial image, too. A prime example of this technology was the popular Pokémon GO game that essentially projected an interactive game world into the ‘real world’. What Does AR Have to Do with Dentistry? So how can we harness the power of augmented reality and make it practical for improving the in-office dental experience? The answer is exciting. Imagine that you one day need dental implants and will be undergoing an extensive smile makeover. Apprehensive about the final result, you schedule a treatment planning appointment, hoping that your teeth will look as natural as possible. At the dentist’s office, your mouth is scanned three-dimensionally, and a computer creates suggestions based on teeth that would be a good match for your individual needs. You peer into a screen, where you can ‘try on’ your teeth, seeing in real time how various shapes, shades, and sizes might look on you. You are able to tweak various elements of the dental reconstruction until you are confident in the final outcome you have chosen. It is quite literally a virtual mirror that lets you try on your very own Hollywood smile before you ever undergo treatment. Of course, it’s not just augmented reality that may soon change the face of dentistry. There are many other exciting technologies that are already available, and some that may be just years away from becoming a reality. For example, we already use digital radiography, which has effectively reduced the amount of radiation required for dental x-rays by 90 percent. The use of intra-oral cameras also makes it possible to minimize the need for x-rays when they would have otherwise been necessary in the past. In the future, the sky is the limit, with dental regeneration a real possibility. As research progresses, it is very possible that instead of replacing your decayed or damaged teeth, your dentist could be helping you to re-grow completely new ones, regardless of your age. As exciting as these technological innovations are, none of them replace the need for proper maintenance and ongoing oral health care. Continuing to visit our office for preventive cleanings and treatments helps to protect your teeth and gums, as well as ensure you are prepared for the treatment possibilities of the future. If you are in search of a dentist in Katy or the greater Houston area, come find out why so many patients are choosing Briter Dental. Call us today to schedule your appointment. We look forward to serving you soon.